Good food is expensive. If you grow it and/or raise it yourself you know how much hard work it takes to put food on your table. A little part of me dies inside when I toss out the bits and pieces of unusable food – even if it is going into the compost or out to the chickens. But I’ve learned that I no longer have to waste anything. I can make stock from all the leftovers. I love homemade stock, but again, I’m not a fan of using perfectly good food – and a lot of it – to make a big batch of it. This is the perfect meeting of the two – no waste of food leftovers and no need to use the good parts. The parts that you wouldn’t eat anyways get used to make more food which makes this virtually free to make. Onion and garlic skins and trimmings, the outer leaves of cabbage and the cores, carrot ends, leafy ends of celery, winter squash skin, corn cobs, pepper tops and cores, the tough, woody stems from herbs like rosemary and thyme are just some of the vegetative parts you can add. 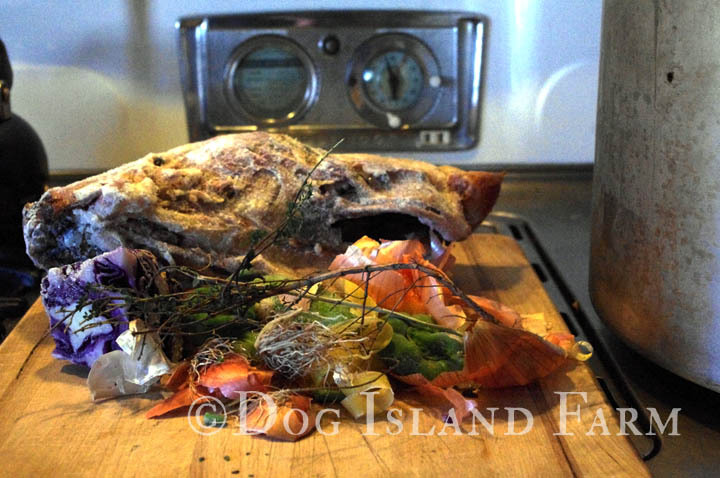 We also like to throw in carcasses and bones from roasted chickens, turkeys, and rabbits and old stewing hens can go in whole (pull the meat off after cooking and use it for later meals). You can just do vegetables if you want, or you can add other types of meat and bone, such as beef or pork. You can even mix the types of animals you use if you want. There are some things you don’t want to add, however, to your stock. Avoid really starchy foods like potatoes and sweet potatoes. Don’t use toxic or fatty vegetable parts either – like avocado skins and pits or tomato tops (but feel free to add tomato skins or cores). As you cook normally you will collect all the trimmings and put them in a bag and freeze them. This allows you to collect a large amount of scraps to make a big batch of stock. You can also do smaller amounts and make just enough stock for a pot of soup but since time is at a premium for some us it works better to do big batches and then pressure can the stock for later use. You can also freeze the stock if you have plenty of freezer space, which unfortunately is also at a premium for us. 1 gallon freezer bags work great for this. 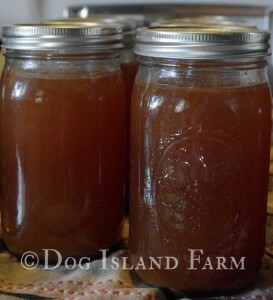 You can also use some types of mason jars to freeze the stock in but it takes longer to defrost them. With gallon freezer bags all you need to do is heat the outside enough so that it slips out of the bag into a large pot. The other benefit of freezing the stock rather than pressure canning it is that you can skip the step of refrigerating it so you can skim the fat off. Just cool it down first before putting it into containers (don’t want to melt the bag or stress the glass more than necessary). 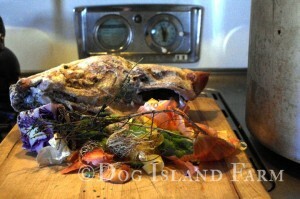 Once you have enough scraps put them in a large stock pot and add just enough water that the scraps are nearly covered. We use a big 7 gallon stock pot so we wait until we have a LOT of scraps. You can choose to add salt now, later, or not at all. I like to wait until it’s almost done so I can taste it. The amount of salt will depend on your personal preference and how much stock you make at once. It isn’t necessary though if you are concerned about your salt intake. A good stock is going to take several hours to make. Turn the heat on high and get it up to a boil. Then reduce the heat and let it simmer on the stove for several hours – usually about 8 hours. Occasionally add more water as needed. 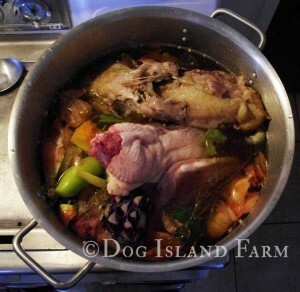 You will know it’s done when the carcasses completely fall apart and the stock has a good flavor. Taste it occasionally and when you like the flavor it’s done. Allow it to cool and then with some large tongs start pulling out the larger pieces of scraps to discard. If you use whole animals you can start putting the meat from them in another bowl. Once all the large scraps are out, line a colander with cheese cloth and strain the remaining broth to get out all the small bits and pieces you couldn’t remove with the tongs. Once strained you can freeze or pressure can it. If you pressure can, put the stock in the fridge for at least 24 hours. You want the fats in it to solidify so you can skim them off. You can skip this step if you are only doing vegetable stock. 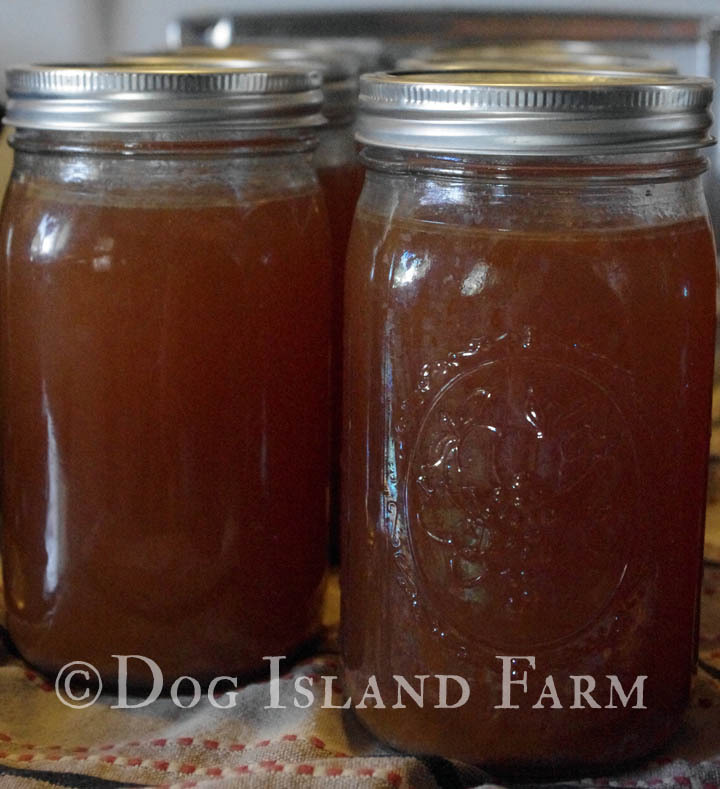 Since I’ve started making my own stock I’ve found that I no longer have to buy it because the scraps we produce are enough to make stock regularly. Bonus is that it’s healthier because there isn’t any MSG (or MSG by another name) and you can control the sodium.